Argentine painter Juan Manuel Sánchez and I are pals. 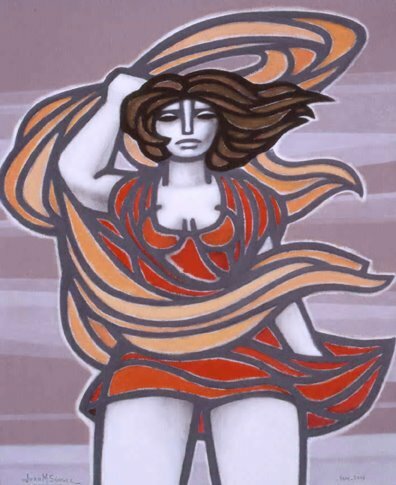 This painting is from his Wind Series. I don't always photograph women. I have been known to have shot sewing machines for the CBC movie critic Rick Staehling in my past. This is why I admire and love Juan. He is obsessed with the idea of woman. That's about all he paints from about noon to late at night. Every one of his paintings is a problem to be solved. It's as if each painting of a woman is a woman to be discovered, studied, learned and understood. Every painting is a Platonic essence. Juan discards everything he can much like a Phileas Fogg desparately burning all available furniture on board his ship home. I asked him once if some day he will draw a line on a canvas and say, "That is woman." His answer was, "Perhaps." The woman illustrated here he first saw on a street on windy Avenida de Mayo in Buenos Aires. The wind, a hot wind from the pampas is called a pampero or a sudestada. The striking woman got off a colectivo (bus) when the wind picked up and her skirt flew. Juan (photo on right) poses with one of his muses (mine, too), Linda Lorenzo.